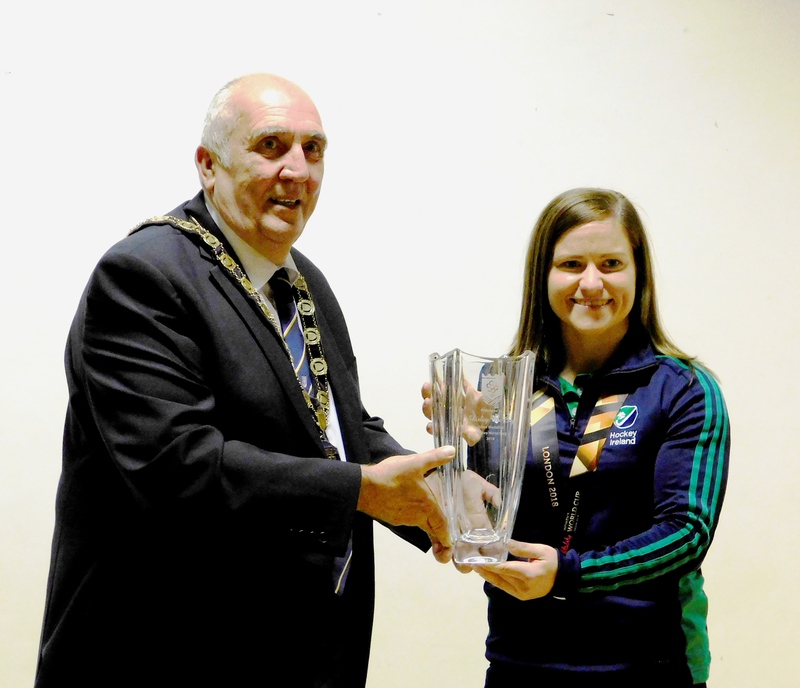 On Thursday 4 October 2018, Chairman of Fermanagh and Omagh District Council, Councillor Howard Thornton hosted a reception in honour of Irish Hockey International and World Cup silver medallist, Shirley McCay. Speaking at the reception, Councillor Howard said, “As Chairman of Fermanagh and Omagh District Council, I am delighted to welcome you all to the Strule Arts Centre this evening. I would like to extend a particularly warm welcome to Shirley McCay, in whose honour this evening’s event is being held. I would also like to extend a warm welcome to Shirley’s parents, Robert and Hazel, sister, Lindsay and her former PE teacher at Omagh Academy, Mary Swann, who have joined us this evening for this very special event. You are all very welcome. First and foremost, this evening provides me, as first citizen, and on behalf of the Council and the people of the district, with the opportunity to publicly recognise your tremendous record as an international Hockey player culminating in that never to be forgotten run in this year’s Hockey World Cup when, as an integral part of the Ireland Hockey Team, you earned an unprecedented and unexpected silver medal. I’m told that football was your first love and it was only when you came under Mary Swann’s tutelage at Omagh Academy that your sporting energy was redirected to Hockey and what a decision that proved to be. You were made captain of the School U-14 team which won the Junior Schools cup. 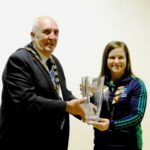 Representative honours followed, firstly with Ulster at U-16 level before donning the green vest of Ireland firstly at Under 16 and then at U-18 level. Indeed, the first time you were honoured by the Council was back in the legacy days of Omagh District Council, when both yourself and Mary attended the Council Offices for a reception to mark Omagh Academy’s Belfast Telegraph and subsequent Kate Russell Cup successes back in 2005, the first and so far only time the school has ever won this illustrious All Ireland title. Juggling hockey and education and the many miles of travelling wasn’t easy, but I think that it is an indication of your character and sense of commitment that you managed it so well. Your club career has taken you all over Ireland and indeed into Europe also. After spells with Omagh Ladies, Randalstown and the Ulster Elks, you played in Dublin with Old Alexandra prior to a spell in Belgium with the Dragons before returning to Northern Ireland and to Pegasus. However, it is your international career which has quite rightly garnered so much attention. You made your debut as a teenager in 2007 against Canada in South Africa before going on to win your 100th cap against France in 2011. Since then, you have gone on to accumulate an amazing 273 international caps, the most international caps by any Irish athlete across any sport which is a phenomenal achievement. You have played in 6 European championships, 3 Olympic qualifiers and of course that wonderful World Cup run. It was brilliant to see how the public embraced Hockey during the World Cup in a manner similar to the rise of cricket in Ireland following the national team’s exploits in 2007 at the World Cup in the West Indies. I hope that your success will encourage others in the locality to try to emulate your success. I sincerely hope that Hockey Ireland receives the funding to enable the sport to progress and mount a serious challenge for qualification for the Olympics in Japan in 2020 following the heartbreak of Rio in 2016 when you failed to qualify by the width of a post. Shirley, your family must be incredibly proud of your career which has taken you all over the world. And I know that Mary, as her PE teacher you must derive an enormous amount of satisfaction and pleasure to see the little girl that you helped develop a love of hockey has turned into a young woman who has played international hockey for so long and with great distinction. I suppose, Shirley with your career, it has almost come full circle. You, as a talent coach with Ulster Hockey, are now charged with unearthing the next crop of talented youngsters who will build on your success and keep Ulster an Irish hockey on the up. I know that there was some doubt about your international future in the aftermath of the World Cup. But I truly believe you have so much still to offer the international set-up as a player and an appearance at the Olympic Gamest would be a fitting climax to your career. Shirley, you have been a wonderful ambassador for your club, your country, your town and your district but most of all for your family and yourself. Can I, on behalf of the Council, thank you for all you have done for the sport of Hockey and wish you every success with whatever you do in the future.”.